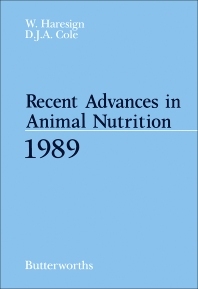 Recent Advances in Animal Nutrition 1989 focuses on the compositions of animal feeds. The book first discusses legislation and its implication for the feed compounder, including marketing of feeds, medicated feeds, and feed additives. The text highlights residues of veterinary drugs in animal products. Licensing of veterinary products; assessment of the safety of veterinary medicines; and development of performance-enhancing drugs are discussed. The book also looks at the vitamin requirements and allowances for poultry; effect of pellet quality on the performance of meat birds; and nutrition of rabbits. The text then discusses the prediction of the nutritive value of silage. History of silage energy evaluation; energy prediction and energy prediction relationships; and nutrient response based systems of rationing are described. The book focuses also on the effect of silage additives and wilting on animal performance; optimizing compound feed use in dairy cows with high intakes of silage; and nutrition of lambs. The text then looks at amino acid nutrition of pigs and poultry and etiology of diarrhea in pigs and pre-ruminants. The selection is vital for readers interested in conducting studies on the compositions of animal feeds.